Nov. 30 - The Meeshy Variety Show at Yota Sahnesi: The Meeshy Variety Show will be an evening of stand-up comedy, short acts and skits, dancing, music and more in English and predominantly put on by members of Istanbul's expat scene. The show will take place from 8:30 p.m. to 11 p.m. at Yota Sahnesi in Beyoğlu and tickets are TL 20 ($4) at the door. Dec. 1 - A 'Table Top Sale and Coffee' benefit for Cihangir Cats: Cihangir Cats, aka Cihangir Cool for Cats, is an organization that assists the local street cat population in Cihangir. On Saturday, Dec. 1 there will be a "Table Top Sale and Coffee Afternoon" held at Cafe Lumiere in Çukurcuma from 2 p.m. to 6 p.m. This is a chance to peruse items for sale such as gifts, clothes and pet products or to donate items of your own to benefit the beautiful creatures of this beloved neighborhood. Dec. 4 - Taco Tuesdays, return of the tacos: Yabangee is testing out a new event series called Taco Tuesdays in the spirit of the American tradition of chowing down on tacos on Tuesdays. An excellent resource for foreigners in Istanbul, Yabangee is a volunteer-run informative English language website and community that hosts a number of regular event series. This time, they will be meeting after work at Azu wcar, a new and authentic Latin Restaurant and Bar in Cihangir recently opened by a fellow expat. There will be tacos and other Latin dishes, DJ music and lots of mingling with the expat crowd. Dec. 5 - Istanbul Toastmasters fortnightly meetings: Istanbul has an active English language Toastmasters club, which is an international organization for people who want to practice and improve their communication, public speaking and leadership skills, that meets up every fortnight at the Gönen Hotel in Taksim. This will be the #294 meeting of the group combined of expats and English-speaking locals and will be held on Wednesday, Dec. 5 from 7:30 p.m. to 9:30 p.m.
Dec. 8 - Standup Turkey: English Comedy Night: The English-language stand-up comedy night 'Standup Turkey' returns to BKM Mutfak on Saturday, Dec. 8 at 7 p.m. This event features eight up-and-coming comedians from all over the world delivering jokes in English. Tickets are TL 39.50 and available on Biletix and at the door. Dec. 11 - Talk on Syrians under protection in Turkey at Studio-X: On Tuesday, Dec. 11, Studio-X Istanbul will be welcoming the chair of the Bahçeşehir University Department of Sociology, professor Nilüfer Narlı, who will be giving a talk in English on "Public Policy and Syrians Under Temporary Protection in Turkey: Daily Life, Survival, Access to Public Services, and Social Inclusion." Located near Tophane, Studio-X is an urban laboratory founded in Tophane as an initiative of the Columbia University Graduate School of Architecture, Planning and Preservation in order to identify city issues and to seek constructive solutions. Dec. 13 - 'Connected Conversations' dinner at Irish pub James Joyce: "Connected Conversations" is a rising event series held all over the world in which participants have the opportunity to hold discourse in English on topics selected from a "conversation menu" with other likeminded individuals seeking to delve deeper within themselves that you possibly have never met before. The first edition in Istanbul will take place at the James Joyce Irish Pub, located on Balo Sokak in Beyoğlu, over a delicious dinner prepared by the venue's new and innovative chef Mark on Thursday, Dec. 13 from 7 p.m. to 10:30 p.m.
Dec. 14 - Yabangee and Senem Selimi's holiday party at 360 Taksim: Yabangee and party guru Senem Selimi have teamed up to host a holiday party at 360 Taksim entitled "December Magic Party." There will be festive music by DJ Koray and surprise live performances throughout the night. The doors will be open from 10:30 p.m. to 4 a.m. and the entrance fee is TL 50 and includes a drink. It is mandatory, however, to register via the event's webpage to be on the guest list at the door. Located on the top floor of the historical Mısır Apartmanı on İstiklal Avenue, 360 Taksim is a chic venue famed for its panoramic views of this spectacular city. Dec. 15 - 'Countdown to Christmas' by Pop-Up Dinners Istanbul: Run by Kay, a former restaurateur and Singaporean-Dutch expat from her home in Cihangir, Pop-Up Dinners Istanbul regularly hosts a variety of themed dinner parties that are popular with the expat crowd for both the opportunity to mingle with fellow foreigners and to dine on rare and delicious food. 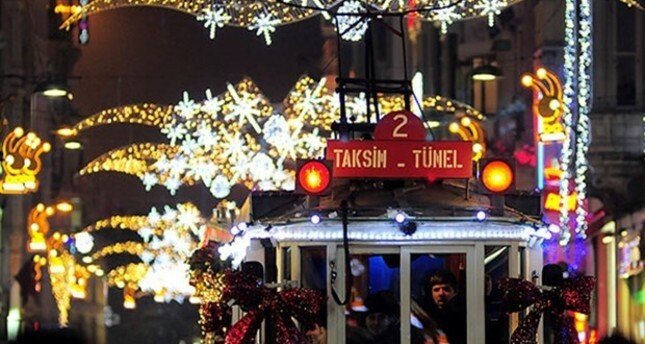 On Saturday, Dec. 15 at 8:30 p.m., Pop-Up Dinners Istanbul will be hosting "Countdown to Christmas," which will have a traditional holiday dinner coupled with Christmas carols, with one sung in between each of the four courses served. Dec. 15 - Karaoke Night at Arsen Lüpen Beşiktaş: Yabangee is at it again and this time they are organizing a "Karaoke Night: Release your Inner Star," which will take place at Arsen Lüpen in Beşiktaş on Saturday, Dec. 15, starting at 9:30 p.m. and entrance is free.